Primos has been in the business of making hunting products since the 1980’s, and their eleven different ground blinds are as popular as ever this year. The Double Bull Deluxe Ground Hunting Blind is 77” hub to hub, and the floor space is 60” x 60”. 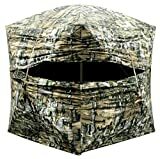 Primus designed TRUTH camo to conceal blinds in any terrain. From inside you get a 180-degree full-front view, and silent slide window closures. With the bag, it weighs 27 pounds. Let’s dive in and take an in-depth look at this offering from Primos to find out how it stacks up against the competition. The size of the Double Bull Deluxe blind is 60” x 60” inner floor space, with a height of 70 inches. It is big enough to fit two large adults, or one adult with multiple kids. A two-person blind is great for versatility: compact enough to take it out alone, but you can always bring a hunting buddy along too. You can also fit some extra gear in it. On the outside, the 77” hub to hub measurement is compact for a double blind. It’s small enough you can brush it in to set up in your favorite whitetail spot. The 180-degree shooting window is a significant selling point of the Double Bull Deluxe. The shooting window height is adjustable. This feature is incredibly helpful and makes the blind even more versatile. It accommodates shooters of different heights, as well as different types of terrain and concealment. The TRUTH camo quality is excellent. Some users have reported deer and turkey walking right up to them while they were inside the blind! The camo pattern works well in any season and just about any terrain. The Double Bull hub system shines when it comes to ease of use. We got our stopwatch out to see how fast this blind can be set up and broken down. Thanks to Primos’ Double Bull hub, you can set the blind up in 45 seconds. It takes slightly over a minute to break down. Ease of use is probably the most significant difference between a cheaper hunting blind and a premium model like the Double Bull Deluxe. Primos offers free YouTube videos demonstrating setup and breakdown of the blind. The included written instructions are not very easy to follow, but the videos make it very easy to learn how to set up and break down the blind. The sturdiness of this blind makes it stand out compared to other blinds, especially lesser models. Every experienced hunter knows you need to air out a new blind before you take it hunting. With a sturdy model like the Double Bull Deluxe, you can leave it assembled outside with no worries. Another feature we loved: you can enter this blind silently, even wearing full gear. There are no zippers and no Velcro. A buckle, two clips, and two black slide-through ties hold the door in place. The Limited Lifetime Warranty adds a lot of value to this blind. It doesn’t cover outright abuse, but many users have reported that Primos repaired their blinds for free even after years of routine use. The first downside we noticed was the weight of the blind, at 27 pounds. It weighs almost twice as much as most other blinds, which typically weigh in at 14-18 pounds. Hauling 27 pounds around your hunting acreage can get old. In its defense, the Double Bull Deluxe is faster to set up and far sturdier than the majority of lightweight blinds. The carrying case is not entirely on par with the overall quality of the blind. We found it difficult to fit the blind into its case; a larger case, or a zippered opening, would have resolved this issue. The strap and buckle system is inconvenient and tends to slip. You may want to consider an aftermarket “ground blind backpack” that fits the Double Bull Deluxe. The takedown straps on the hub were on the short side, but still usable. Some users reported a simple DIY upgrade: replace the takedown straps with paracord. We’re picky, but Primus could improve the camo netting. It catches dew when it’s left set up overnight, and also lets in mosquitoes. No one likes early morning hunts in a mosquito-filled blind. Ron A says most other blinds he’s owned in the past didn’t make it through more than a season or two before falling apart. Since going with a Double Bull, he’s been thrilled. For Sean R., it was the size of the blind that was most impressive. He and his wife were able to sit inside and still have room for a cooler and chairs with space to spare. The Primos Double Bull Deluxe blind is versatile, easy to use, and silent. The Double Bull Deluxe blind is the #6 choice in our list of best hunting blinds. This blind stands out from the competition. Primos is the only company with the Double Bull hub system. The under-one-minute setup time is fantastic. The silent entry and exit is another excellent feature we loved. Although it’s on the heavy side and doesn’t come with a perfect carrying case, it’s easy to set up and incredibly sturdy. Whether you use a rifle, bow, or crossbow, and whether you hunt deer, turkey, or predators, this blind is a solid choice that will last many years. It even comes with a lifetime guarantee. The Double Bull Deluxe is a premium blind, not a bargain-priced blind, but it’s worth the investment.